This concept represents the in-game character controlled by the player—as opposed to Non Player Characters who aren't. Typically the game puts you in charge of at least one entity, but the extent to which that entity is an actual character, as opposed to being a Featureless Protagonist or Non-Entity General, depends on the genre, the game, the game's developers, and even (if Character Customization is available) the player him- or herself. Our page on Player and Protagonist Integration has more details on the different points along the scale that are possible here. 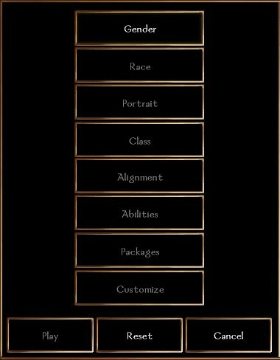 Sometimes, the term PC only refers to The Protagonist, particularly if they are created by the player, while NPC is used even for other party members who the player still controls but are preexisting characters within the game world, rather than a personal avatar. For more information on possible PC/NPC party configurations, see Player Character Calculus. This largely stems from the PCs being the main characters in their story and, more importantly, knowing it. Finally, a wise word to all tropers: don't conflate Player Characters with players. Ryu punches Ken, Ryu does not punch the player. Unless something has gone horribly wrong. Or something has gone horribly right.